A new day is dawning on the food and beverage industry as the hunt for growth is very much on. While merger and acquisition is the hot strategy of the moment, we believe there is more than one possible pathway to growth. We are indeed in the midst of a new evolutionary period in food and beverage: disruption, stark challenges and enticing opportunities abound. And as with the dawn of any new era, it is accompanied by an inevitable proliferation and “great dying” as a new order shakes out. Much of the failure we witness in the food and beverage sector is heightened — a created chaos, so to speak, as companies of all sizes and types hunt for pockets of growth. The question that is often central to our strategic engagements is how best for business leaders to think about their existing assets — especially the large, legacy brands anchoring their portfolios — and how to evaluate the new opportunities for premium product development in spaces that have been foreign. 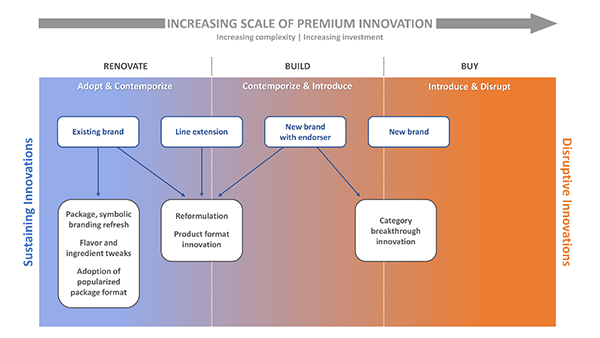 We have identified three vital levers that can aid companies looking for strategic pathways to growth within the current food and beverage landscape: Renovate, Build and Buy (RBB). All three levers are viable strategies that medium to large firms should consider as they build a portfolio that will provide sustainable growth. However, using RBB requires that leaders apply a proper perspective of each lever’s roles, opportunities and limitations in contributing to portfolio growth. We believe there are certain principles business leaders with CPG food and beverage firms should consider as they determine the role that RBB will play across their business units and organizations and to what extent premium product development intersects with each of these levers. Renovation, building and buying sit on a spectrum of increasing complexity in terms of the attributes and benefits suggested by the product/brand and the level of institutional investment required to bring such innovation to market. To this point, we can’t help but to borrow and adapt the terminology coined by the “father” of business innovation theory, Clayton Christensen, who described innovation as either sustaining or disruptive.